Whether we’re making art or just looking at it, were applying our innate ability to recognize patterns. wander into the imaginative and inventive territory, hence: tools, machines, scientific research, music and art. Karen Woods has long been captivated by a view of the world “from the inside looking out”. The subject reveals itself primarily in paintings of streetscapes as seen from the inside of a car, often through a rain-soaked windshield. Her new paintings and new large scale works on paper launch this motif out to sea. While not geographically far from the city streets, her seascapes present the entirely new challenge of painting water through water. STEWART GALLERY is a contemporary art gallery located in Boise, Idaho. Founded in 1987, the gallery has committed itself to the advancement and development of contemporary art. The gallery actively represents a small group of established and mid-career artists, specializing in painting, drawing, sculpture, installation, and limited edition prints. We exhibit a variety of work, ranging from non-objective to contemporary realism. Stewart Gallery is dedicated to building the careers of the artists it represents through exhibitions, acquisitions, publications, and projects. 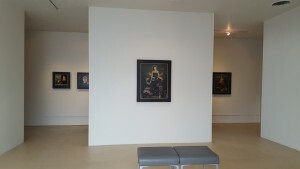 In addition to mounting exhibitions, Stewart Gallery works closely with individuals and corporations building collections, locating works of art, providing art advisory services, and participating in national art fairs. Stephanie Wilde’s solo exhibition Paramnesia. This exhibition will include pieces from the Golden Bee Project as well as several new pieces from her work on the disorder of memory. These paintings reference cultural memory, enlightening the observer to the behaviors of the past as they reference the present. His paintings invite the viewer to enter a world of disparate subject matter and to explore the landscape in which they find themselves. The narrative is there to be discussed or as Macdonald hopes, created for oneself. Boise artist Karen Woods presents a new body of work based on her journeys to Wilder, Idaho. Her paintings put the viewer alongside her traveling by car, experiencing a rainstorm. Karen Woods’ exhibition, The Way to Wilder, installed at the Boise Art Museum. In this latest body of work, Woods is introducing larger scale and a looser painting style, her aim is to give the viewer a feeling of foreboding in the midst of a storm with water covering the windshield and a palette that evokes dampness and cold. Woods has the ability to make commonplace more than we imagine. If you haven’t had a chance see her exhibition, this is a small taste of a beautiful show. Hope you can take time to visit the museum and Stewart Gallery to see Karen’s paintings. We are pleased to announce The Way to Wilder, an upcoming exhibition of new works from artist Karen Woods at Boise Art Museum. This new body of work was inspired by a recent journey to Wilder, Idaho during a rain storm. 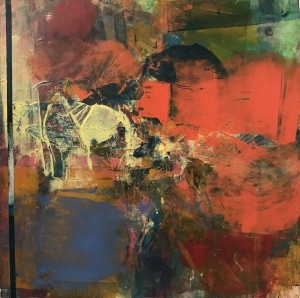 The experience of the drive and the resulting images compelled Woods to try a new approach to painting, combining the rich color palette and technical skill she is known for with a hint of wildness. The paintings in this series are a raw and intimate experience of this journey. Japanese artist Yuko Nakaya has arrived in Boise, and is installing her solo exhibition at the gallery next week. Nakaya is the 2001 recipient of the YUMEHIROBA HARUHI BIENNALE (Aichi) Award for Excellence. Her work is shown primarily in Japan and Brussels. Stewart Gallery is honored to be introducing her work in the United States. Japanese artist, Yuko Nakaya, is the 2001 recipient of the YUMEHIROBA HARUHI BIENNALE (Aichi) Award for Excellence. Her work is shown primarily in Japan and Brussels. Stewart Gallery is honored to be introducing her work in the United States. Japanese artist Yuko Nakaya creates lush and compelling installations that incorporate painting, sculpture and drawing. Her work is an exploration of borders; borders as walls between nations and cultures, the border between the conscious and unconscious mind, and the borders we create between ourselves and others. Nakaya integrates a wide variety of materials in a delicate balance, creating works that move seamlessly between the traditional boundaries of two- and three- dimensionality in artwork. Her paintings combine a rich color palette and intense contrast to create a palpable depth, with forms that seem to rise up off the canvas and plunge deep beyond it. A two-dimensional painting presented on the floor becomes the base of a sculptural installation. Lines made from vinyl tape traverse floors and windows in an immersive and multi-planar drawing. The ability to define pieces by category disappears, breaking down the borders we have assigned them. There is an ephemeral tension in Nakaya’s work, an impression that each piece captures a fleeting moment of perfection. It is the anticipation in watching a soap bubble, knowing that at any moment it will burst, that the flower in perfect bloom will wilt tomorrow, and that the sunset is already disappearing behind the skyline. This transience momentarily breaks down the border, allowing the viewer to glimpse the conscious and the unconscious simultaneously, in an instant of clarity between states.